November somehow crept up on me yesterday, which means my family will be in town for Thanksgiving in a few weeks. I have no idea what I’m making for the meal, but I know this much: they’ll expect pumpkin squares for dessert. These squares are yummy and gooey, and they have the added advantage of being the ONLY recipe I inherited from my mother. She’s one of the most fantastic people I know and great at many things, but in our house, baking was left for the bakeries. 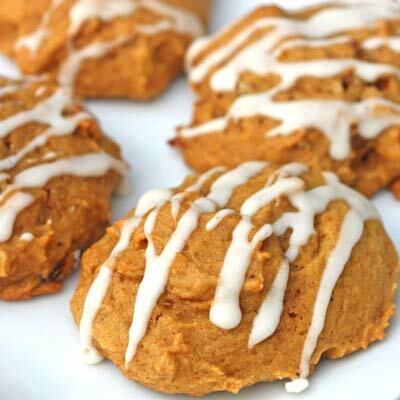 For a healthier, and just as yummy pumpkin dessert, try the cookies below as well. For the crust: combine all but one cup of the cake mix, 1/2 cup oil and 1 egg. Spread it into a 9×13 pan. For the filling: combine pumpkin, pumpkin spice, brown sugar, 1 egg and soy milk. Mix and pour over crust. For the topping: Combine the one cup of cake mix, 1/4 cup sugar, cinnamon and Earth Balance until crumbles. Sprinkle over the top. Bake at 350 for 45 minutes. Best served warm. Combine flour, baking soda, baking powder, cinnamon, nutmeg and salt in a bowl. Beat honey, Earth Balance, pumpkin, egg and vanilla extract until smooth. Gradually beat in flour mixture. Let mixture cool in the fridge for 20-30 minutes. Drop by rounded tablespoon onto prepared baking sheets. Bake at 350 for 15-18 minutes. Cool completely. Drizzle Glaze over cookies: 1 cup powdered sugar, 2t soy milk, 1t melted Earth Balance and 1/2t vanilla. A question about some of the ingredients. For the squares, you listed one large can of pumpkin spice and for the cookies – one cup of canned pumpkin. Could you clarify? Are we talking can of pumpkin pie filling or can of pumpkin or something else? just plain pumpkin. the big one is a pound. the cookies only need a cup, so buy the smaller can. or just cook a pumpkin–then you get the seeds too! Thanks, I have closure now.